The Mayline CSII modular office furniture is comprised of durable all-steel components at value-based prices. Select a credenza, return, pedestal cabinet, hutch, lateral file, bridge, or a complete desk unit. Mayline's focus has always been on innovative office furniture. With stylish office desk designs to complement any d_cor, Mayline and Tiffany Industries feature durable office furniture products at exceptional prices. CSII office workstations quickly and easily configure and reconfigure to accommodate whatever it is you need to store, organize or display. As your interoffice technology and personnel evolve, so does CSII. 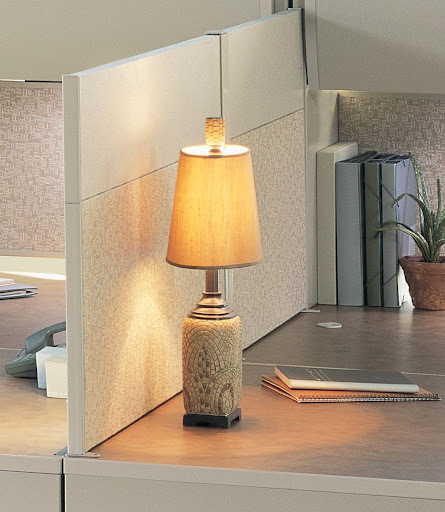 You can reshuffle and reconfigure entire office desks easily, reducing downtime. Building on a design using rugged all-steel desk construction, we�ve created an office furniture line boasting sleek functionality and a stylish new look, all in a package that registers high on the value scale. Desk cabinets provide a cavernous 30" of storage. Full extension ball bearing slides are used on all file cabinets. Incorporate Mayline�s height-adjustable desk for the perfect ergonomic workstation. Overhead units are available with our ÐSoft CloseÓ system, providing safe, secure and quiet closure of overhead doors, and desk-mounted hutches with elegant, radiused front doors preserve workspace and create privacy when used with optional tack panels. Worksurfaces use High Pressure Laminate with PVC edging covered on bottom with backer sheet to prevent warping; core is 1 1/8" thick 45-lb. density particleboard. Legs and modesty panels are made from cold rolled steel. Standard wire management grommets and are provided with cable routing clamps. 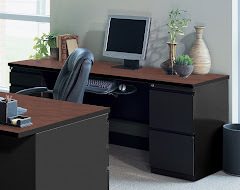 All office desks come with standard leveling glides and grommets. Lateral file cabinets and personal filing cabinets have an integrated cap that allows the files to be used as a freestanding file. They also slide easily under credenzas and returns for optimal filing efficiency. 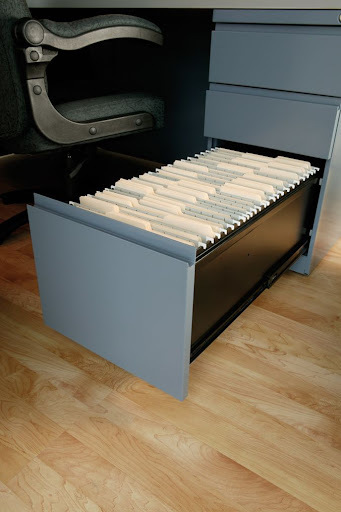 File drawers feature full extension ball bearing slides, with adjustable leveling glides. Locks are standard and allow for the lock cores to be changed to key entire suites alike. All drawer units are equipped with an integral locking device to prevent more than one drawer from being opened at one time. Non-handed legs and desk cabinets make installing amazingly simple. Freestanding CSII workstations quickly and easily configure and reconfigure to accommodate changing work trends and requirements. Desk file cabinets provide a cavernous 30" of storage. Full extensions ball bearing slides used on all pedestal drawers. 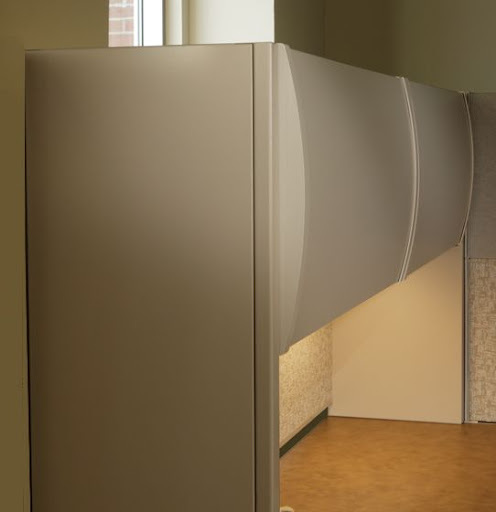 Desk-mounted hutches with elegant, radius front doors preserve workspace and create privacy when used with optional tack panels. Fabric panels are available in a variety of heights and can be stacked or ganged to create virtually any privacy and fabric combination. Ability to add the healthy benefits of height adjustable workstations by incorporating VariTask bases in bridge and corner applications. Improve workspace efficiency by adding comfort and flexibility to workstations with Mayline ergonomic support products. Desk mounted hutches with elegant, radiused front doors preserve workspace and create privacy when used with optional tack panels. 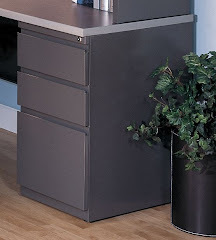 Desk file cabinets provide a cavernous 30" of storage. Full extension ball bearing slides used on all drawers. CSII provides a consistently stylish look with its radiused overhead doors providing high-end style at mid-market pricing. All pedestals and legs are non-handed making specifications and installation amazingly simple. 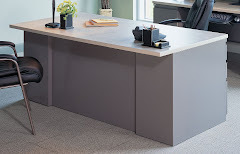 Desks feature a full 30"-deep pedestal for filing and/or storage space. Legs and modesty panels made from Cold Rolled Steel. Pedestals have full extension ball bearing slides on all drawers, with adjustable leveling glides, pencil tray and box file divider. Overhead hutch has an all-steel cabinet body with a contoured door for aesthetics. Doors travel up and over top of unit using ball bearing slides. Standard locks are concealed under cabinet body and are core-removable to create keyed-alike suites. Hutch has 13 7/8" deep shelf which is 20" above worksurface. Meets or exceeds all ANSI/BIFMA standards.